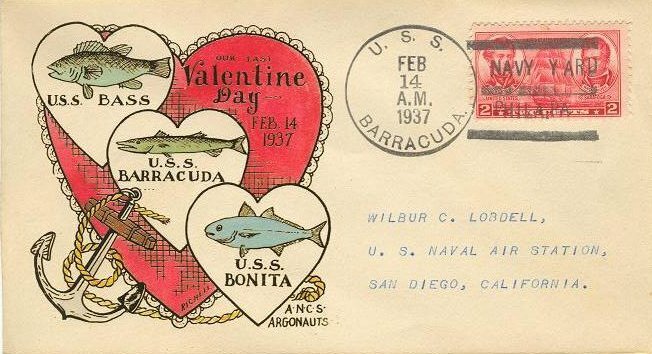 Barracuda Class Submarine: Laid down, 20 October 1921, at Portsmouth Navy Yard, Portsmouth, N.H.; Launched, 27 December 1924; Commissioned USS V-2 (SF-5), 26 September 1925; Renamed Bass, 9 March 1931; Reclassified (SS-164), 1 July 1931; Decommissioned, 9 June 1937, at Philadelphia, Navy Yard, Philadelphia, PA.; Recommissioned, 5 September 1940, at Portsmouth, NH; Decommissioned, 3 March 1945, at Submarine Base, New London, CT.; Struck from the Naval Register, 10 March 1945; Final Disposition, sunk as a target, 12 March 1945, southeast of Block Island in 155' of water. 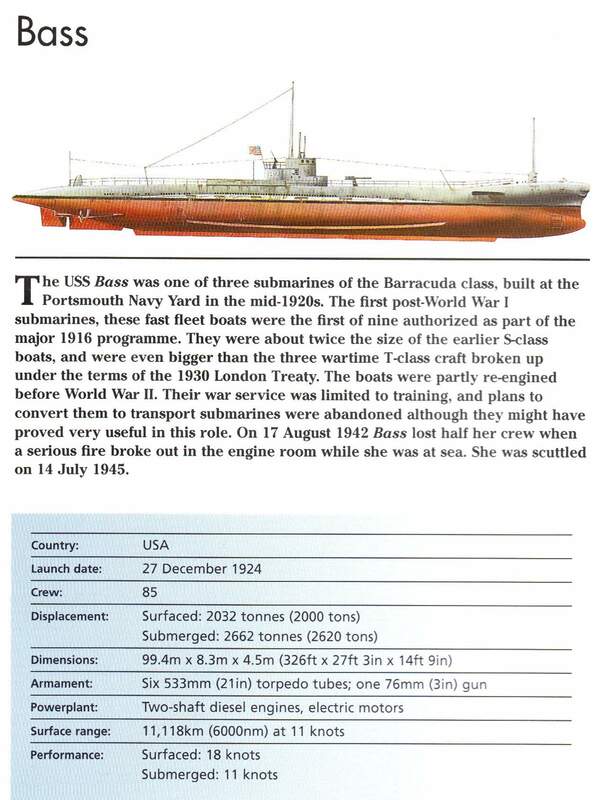 Specifications: Displacement, Surfaced: 2,000 t., Submerged: 2620 t.; Length 341' 6" ; Beam 27' 7"; Draft 14' 7"; Speed, surfaced 21 kts, Submerged 8 kts; Depth Limit 200'; Complement, 6 officers, 50 enlisted; Armament, six 21" torpedo tubes, four forward, two aft, 12 torpedoes; one 5"/51 deck gun; Propulsion, Busch-Sulzer Diesel Engine Co., diesel engines, hp 4100; Fuel Capacity, 90,935 gal., Elliot Motor Co., electric motors, hp 2400, Battery Cells 120, twin propellers. 68k The sponsor of V-2 (SS-164), Mrs. Douglas E. Dismukes, wife of Captain Dismukes, sit next to each other on 27 December 1924 on the V-2's launching day. Image cropped from # NH 56927 Mount Vernon, submitted by Bill Gonyo. 1.27k LARGEST NAVY DIVER-TAKES THE WATER. 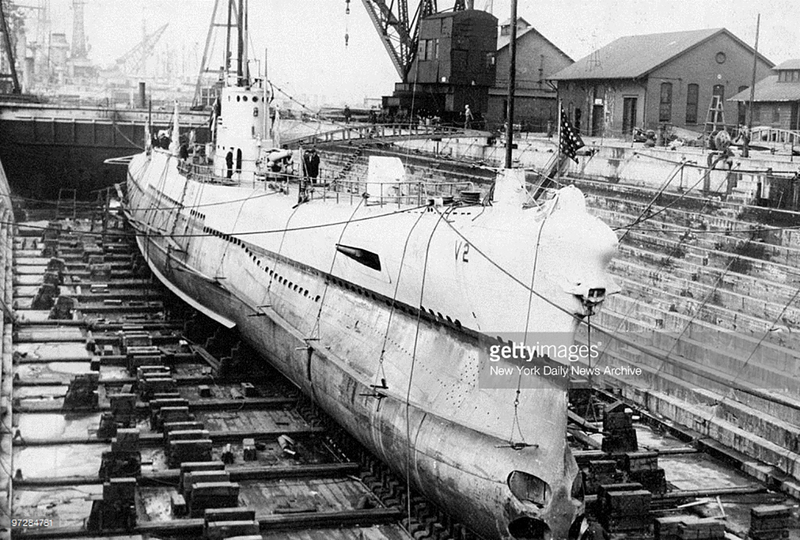 The V-2 (SS-164) the largest submarine ever constructed for the United Stales Navy, has been launched at Portsmouth. N. IL, Saturday. 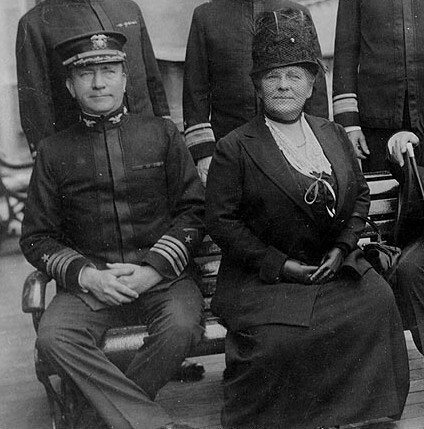 Mrs. Douglas Dismukes served as sponsor for the submarine, which will be tested in the Atlantic. Image and text provided by Library of Congress, Washington, DC. Photo from Evening Star. (Washington, D.C.) 1854-1972, 29 December 1924, Image 17, via chroniclingamerica.loc.gov. 134k PDF entitled "How the Diesel engine came to America." 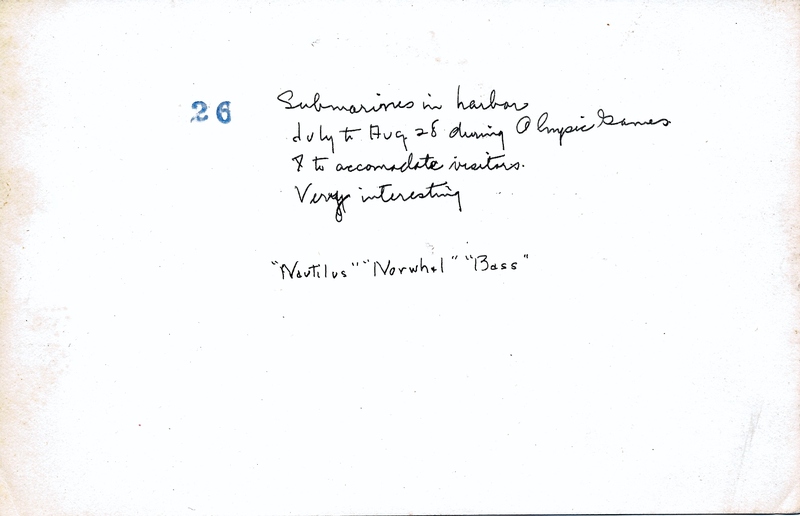 On 09/26/25 they were installed on the V-2. Photo courtesy of subvetpaul.com. 299k Photo probably taken during trials in 1925. Caption reads V-2 "Full Speed Run". USN photo courtesy of Angie Mattke. 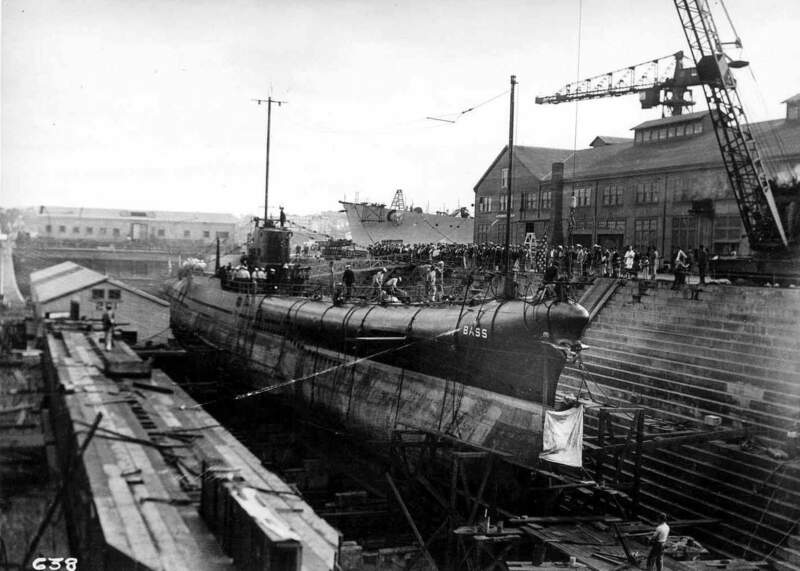 728k V-2 (SS-164) overhauled in drydock at the Brooklyn Navy Yard. Photo by Harry Warnecke/NY Daily News Archive via Getty Images courtesy of gettyimages.com. 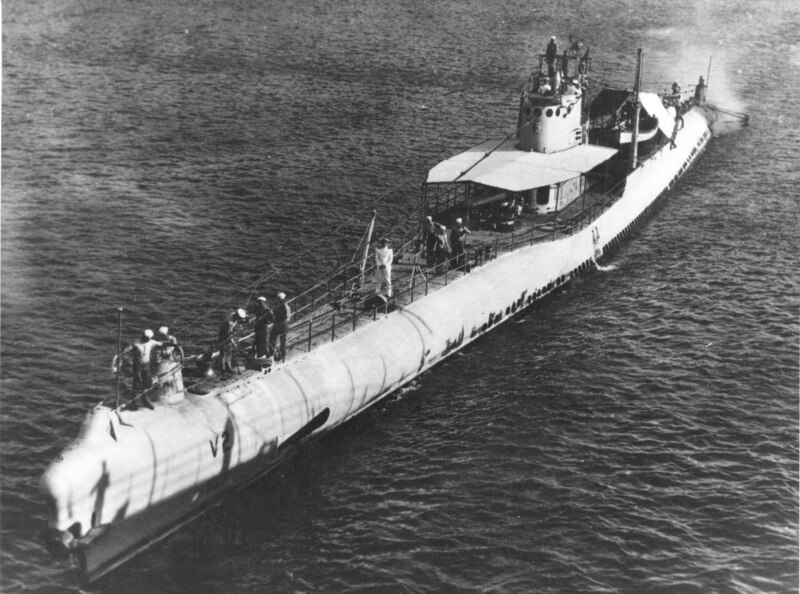 80k Portside view of the V-2 (SS-164) underway, circa 1920's. Note small boat after the conning tower. USN photo courtesy of Darryl L. Baker. 294k History of the V-2 (SS-164). Text & photo courtesy of Scott Koen & ussnewyork.com. 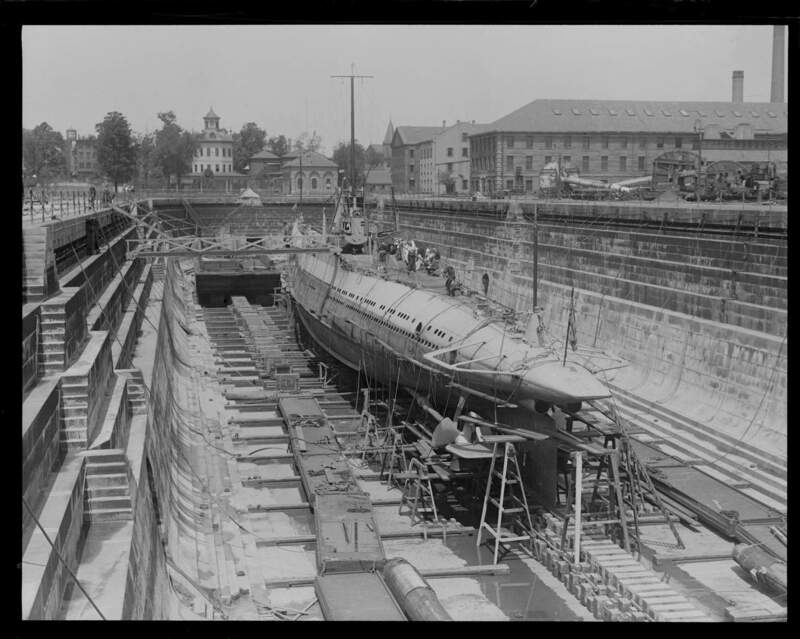 357k V-2 (SS-164) in Charlestown Navy Yard, 1927. Photo courtesy of the Boston Public Library, Leslie Jones Collection via Sean Hert & flickr.com. 274k V-2 (SS-164) in Charlestown Navy Yard, 1927. Photo courtesy of the Boston Public Library, Leslie Jones Collection via Sean Hert & flickr.com. 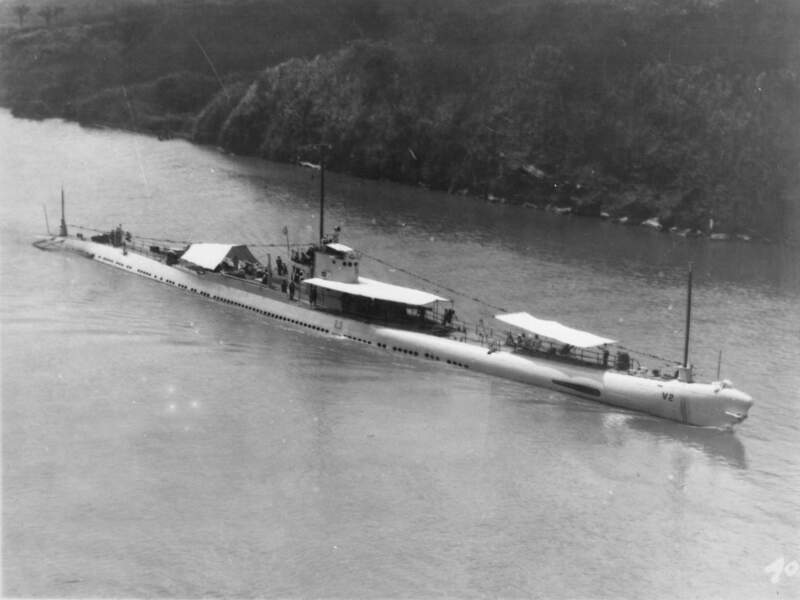 183k Starboard side view of the V-2 (SS-164) probably transiting the Panama canal, circa late 1920's. USN photo courtesy of Darryl L. Baker. 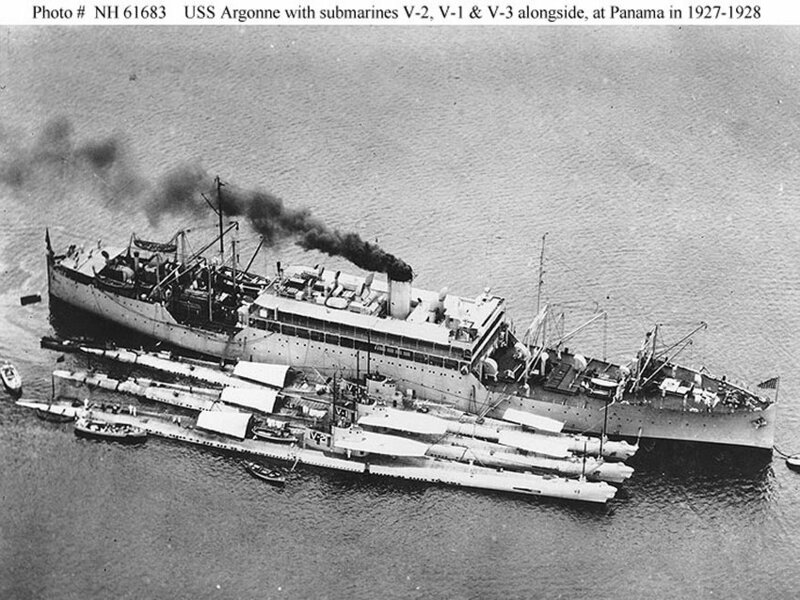 195k Portside view of the V-2 (SS-164) probably transiting the Panama canal, circa late 1920's. USN photo courtesy of Darryl L. Baker. 77k Fleet submarines had to be far larger than their predecessors to reach higher speeds & to run greater distances. 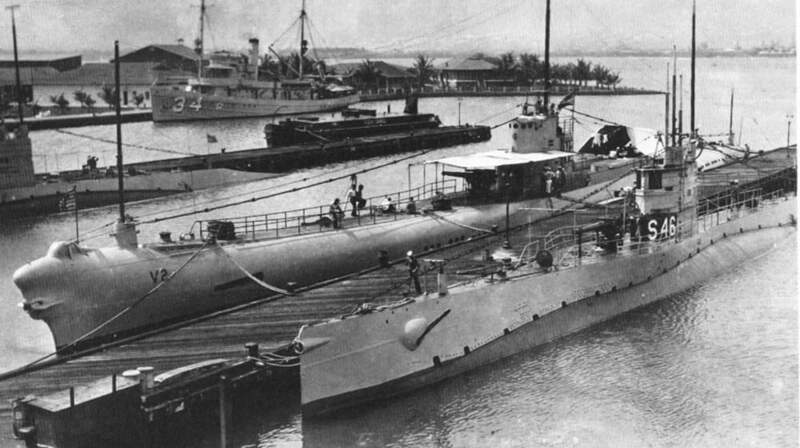 V-2 (SS-164) lies alongside S-46 (SS-157) at the sub base in Coco Solo in the Canal Zone, circa mid 1920's. In the background is the minesweeper Swan (AM-34). 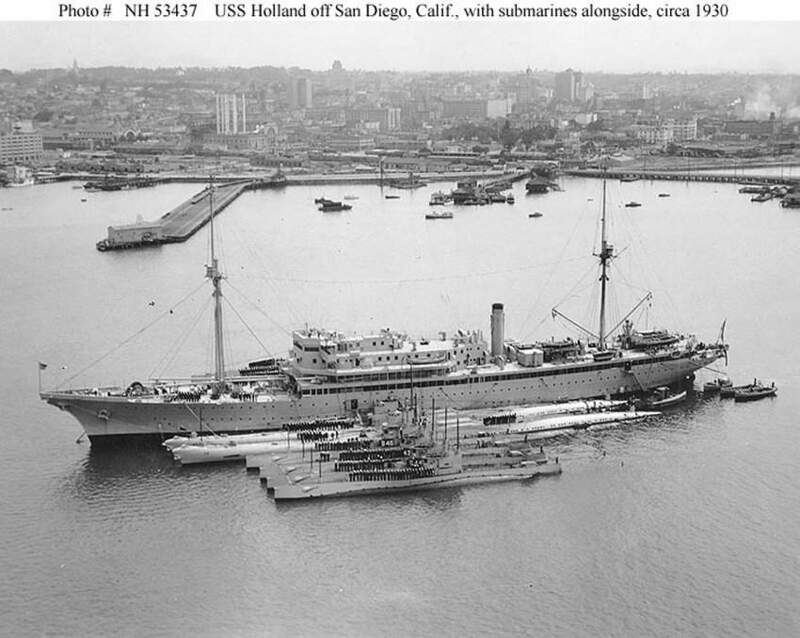 Note the big telescopic masts fore & aft, intended to raise the submarine's radio antennas and thus to increase her radio range. Photo & text courtesy of U.S. Submarines Through 1945, An Illustrated Design History by Norman Friedman. Naval Institute Press. 61k V-2 (SS-164) at Gonaives, Haiti, waiting for an Admiral's inspection, March 1927. USN photo courtesy of Robert M. Cieri. 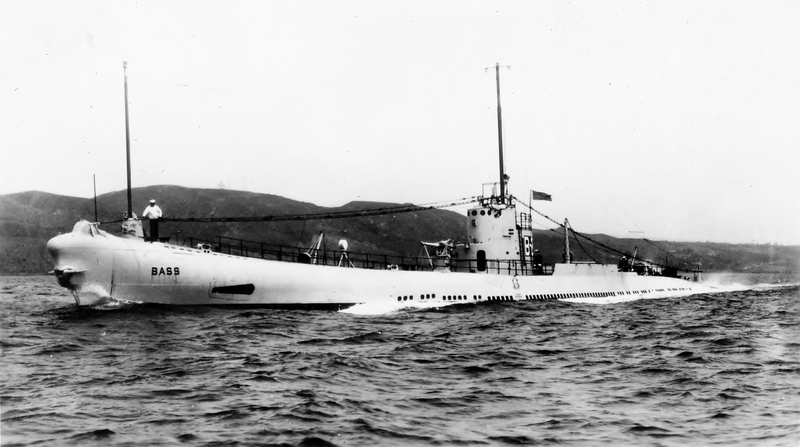 Bonita (SS-165). Courtesy of the San Francisco Maritime Museum, San Francisco, California, 1969. 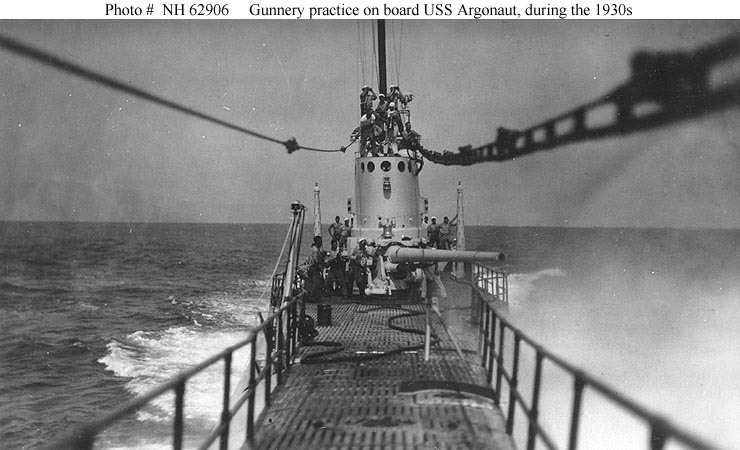 USN photo # NH 69094, from the collections of the US Naval Historical Center. 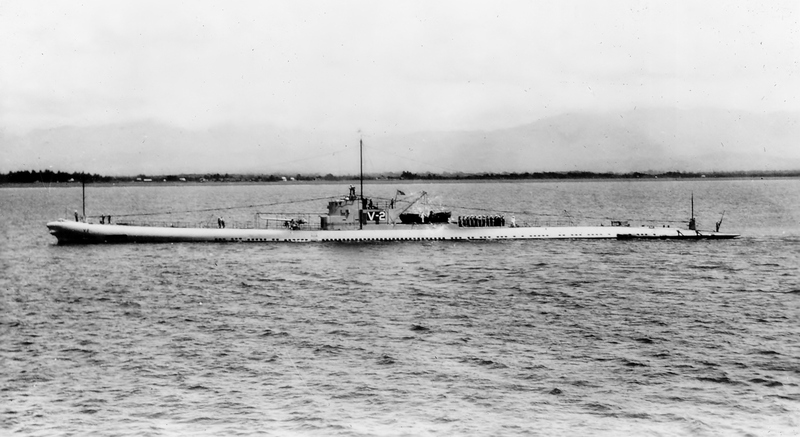 225k Starboard side view of the V-2 (SS-164) on 2 January 1929 at anchor, probably on the West Coast. USN photo courtesy of Darryl L. Baker. 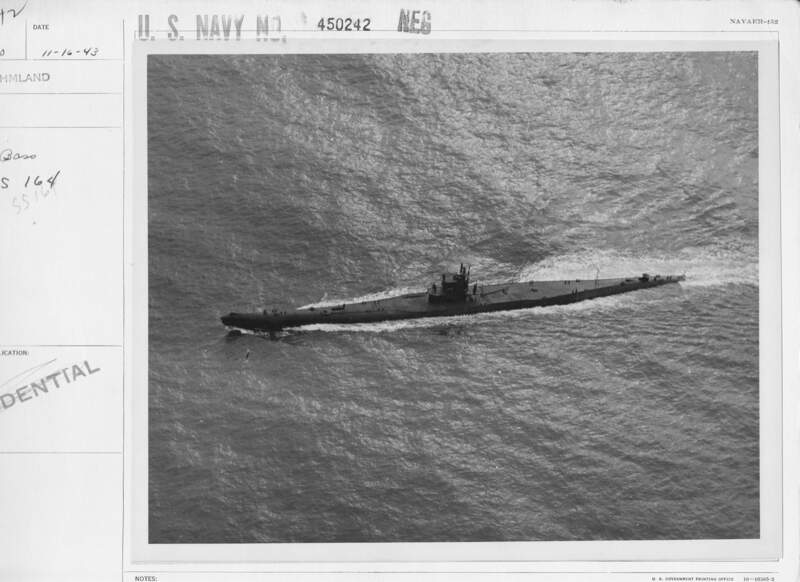 S-42 (SS-153); USN photo # NH 53437, from the collections of the US Naval Historical Center. 1.32k Submarines at San Pedro July to August 32 Olympics. Inboard from left to right; Narwhal (SS-167), Nautilus (SS-168) & Bass (SS-164). 459k The Bass (SS-164) is seen in dry dock one at Mare Island between 19 September and 31 October 1933. The yard's 150 ton floating crane is on the far left. The target raft 124 (the long narrow vessel with workers on top), YF-201 and 200 are in dock with the Bass on the left. 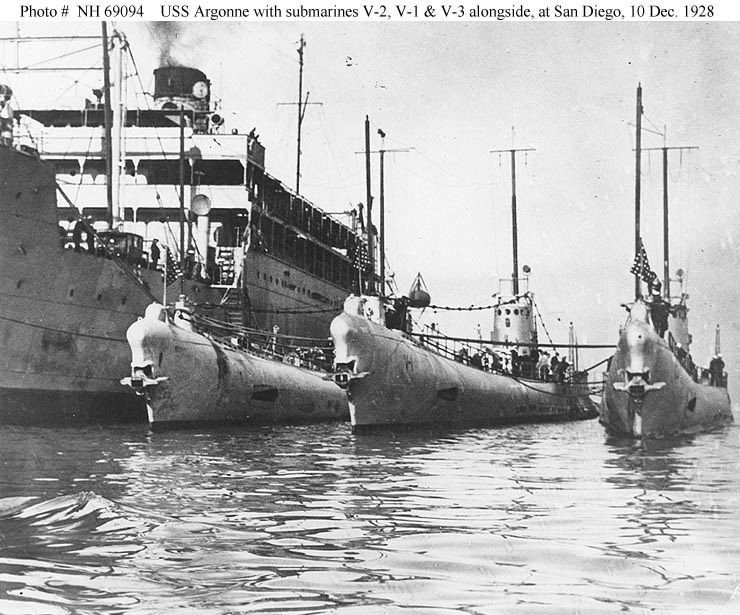 The bow on the right is the San Francisco (CA-38) being outfitted at yard. USN photo courtesy of Darryl L. Baker. 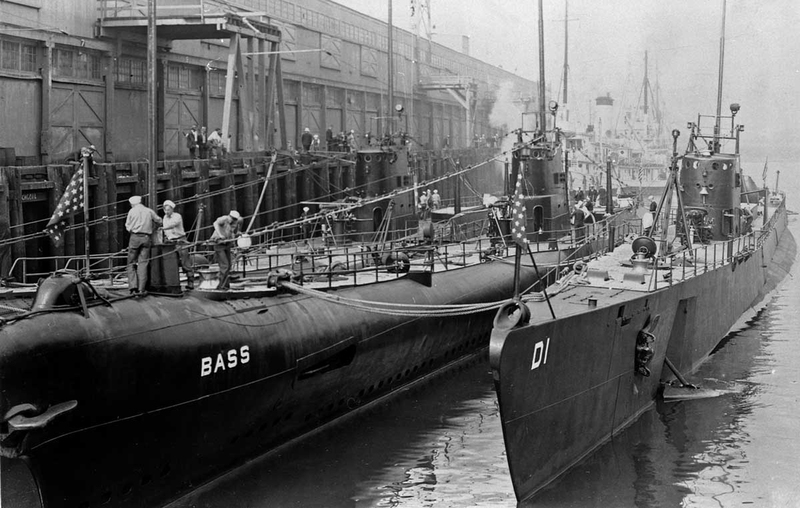 141k The Bass (SS-164) when she was assigned to Rotating Reserve Submarine Division 15, is seen in dry dock one at Mare Island between 19 September and 31 October 1933. 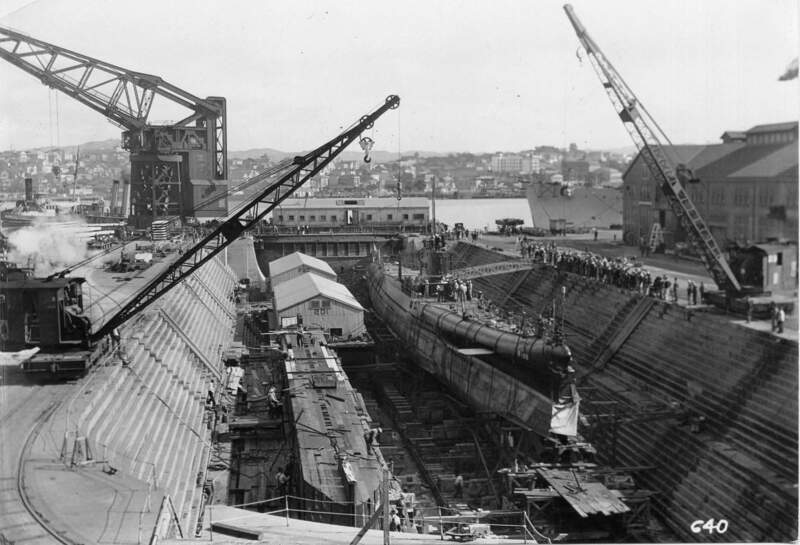 The bow on the right is the San Francisco (CA-38) being outfitted at yard. Bass shows her bulbous forefoot (carrying her bow torpedo tubes) and her clipper stern & flared deck. As in many surface ships, the bulbous bow was intended to reduce wave-making resistance & thus to improve the submarine's surface speed; the unusual bow was expected to make the deck drier. USN photo courtesy of ussubvetsofworldwarii.org web site. Partial text from DANFS & partial text courtesy of U.S. Submarines Through 1945, An Illustrated Design History by Norman Friedman. Naval Institute Press. 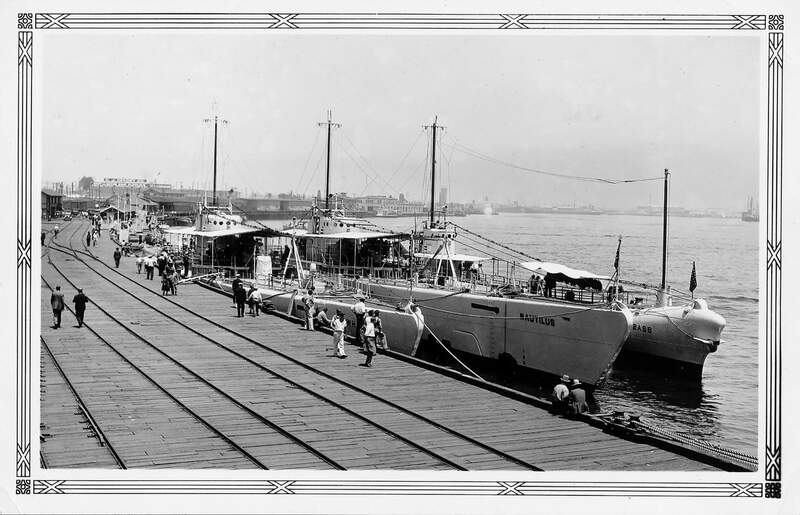 139k Bass (SS-164), outboard and Bonita (SS-165) at San Francisco, California, circa the early 1930s. USN photo # NH 56516, from the collections of the US Naval Historical Center. Courtesy of J.A. Casoly. 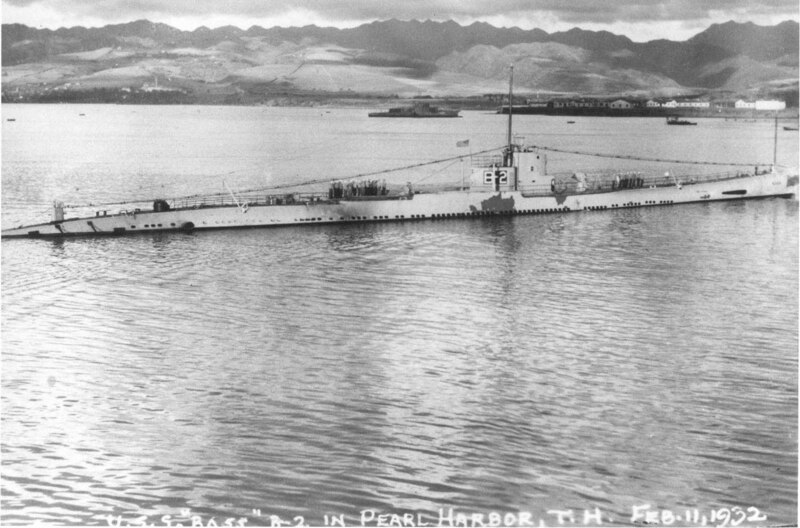 175k Broadside view of the Bass (SS-164) at Pearl Harbor, 11 February 1932. USN photo. 89k Bass (SS-164), outboard and Bonita (SS-165) with civilian visitors on board, at San Francisco, California, May 1932. Note that Bass has a 3"/50 deck gun, while Bonita carries a 5"/51. Also note the retractable embarkation ladder built into Bass's hull amidships. Photographed by Lauzin. USN photo # NH 91778, from the collections of the US Naval Historical Center. 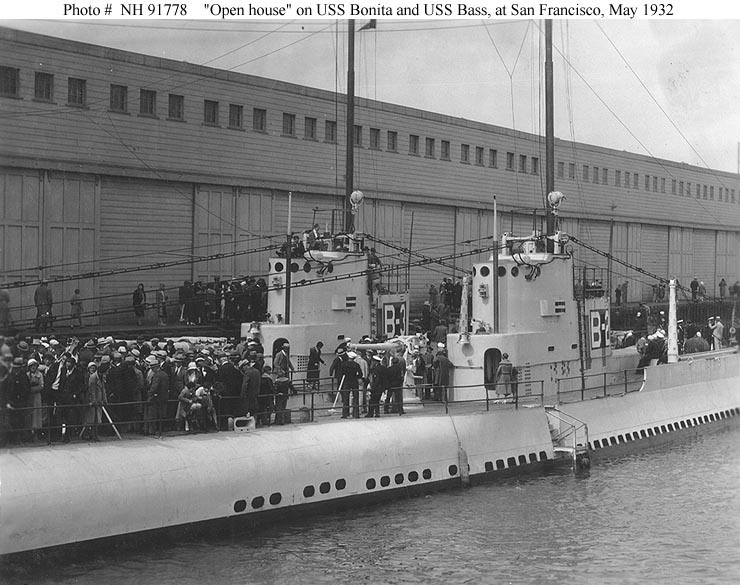 119k Bass (SS-164), outboard and Bonita (SS-165) with civilian visitors on board, at San Francisco, California, May 1932. Photographed by Lauzin. 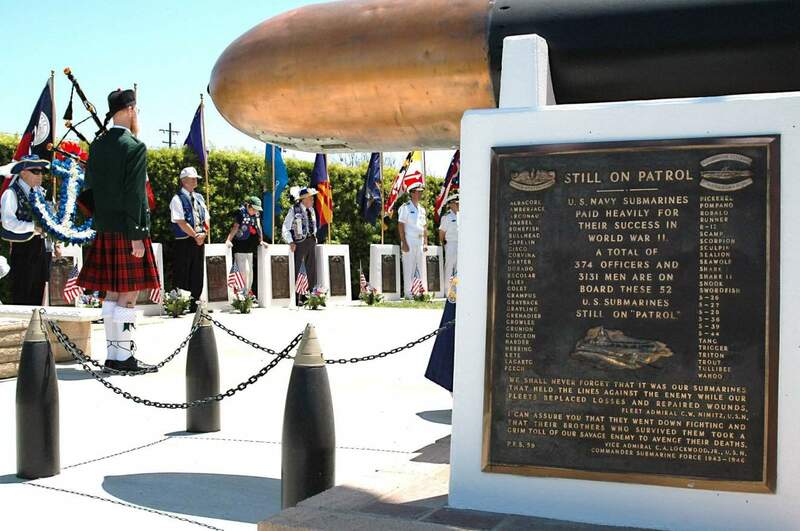 Source: Naval History and Heritage Command, Photo No. NH 91779 courtesy of Mike Green. 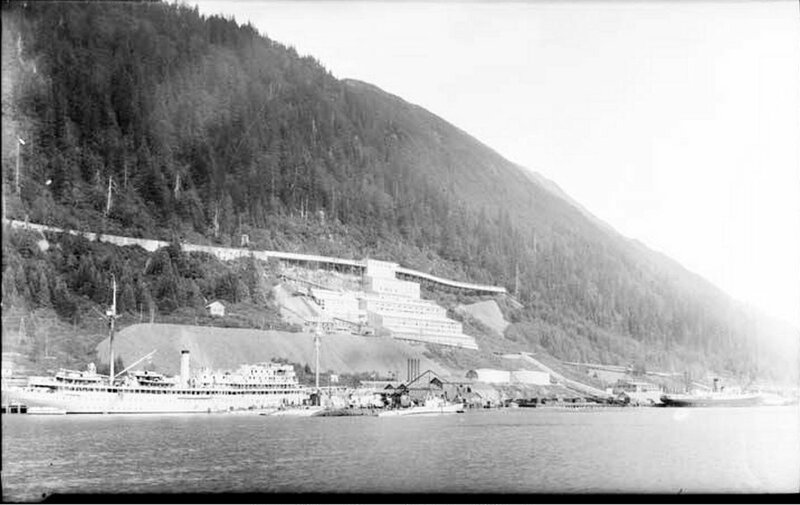 83k Tender and submarines at dock in Juneau, Alaska, July, 1934. 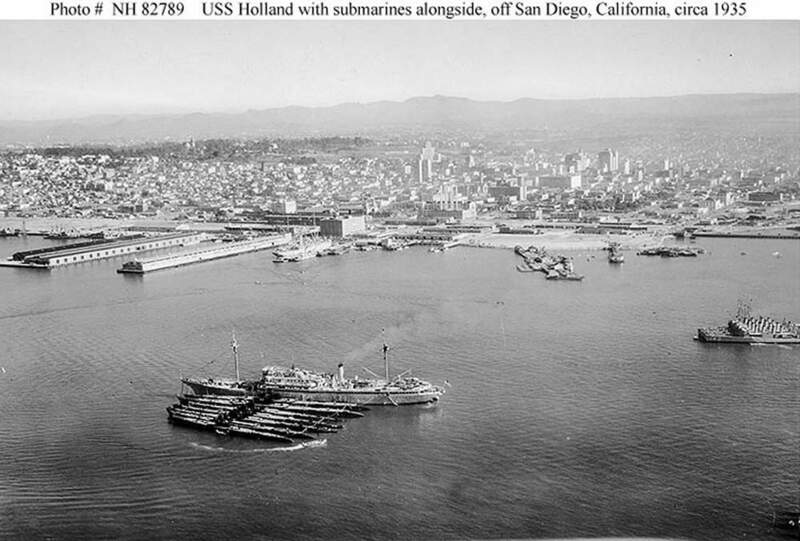 At far left, tender Holland (AS-3), submarines (l to r) Bass (SS-164), Bonita (SS-165), Barracuda (SS-163), Nautilus (SS-168) and Narwhal (SS-167). The mill of the Alaska Juneau Gold Mining Company is in the background. Photo by Winter & Pond courtesy of the Alaska State Library. Submitted by Joe Radigan. 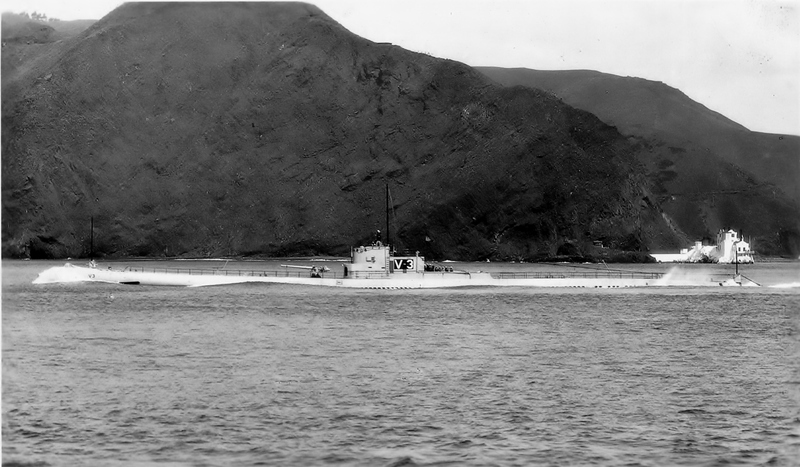 Narwhal (SS-167). Photo courtesy of the USNHC, NH # 80-G-63334, OfficialUSN photo now in the collections of the National Archives. Narwhal (SS-167) USN photo courtesy of Scott Koen & ussnewyork.com. 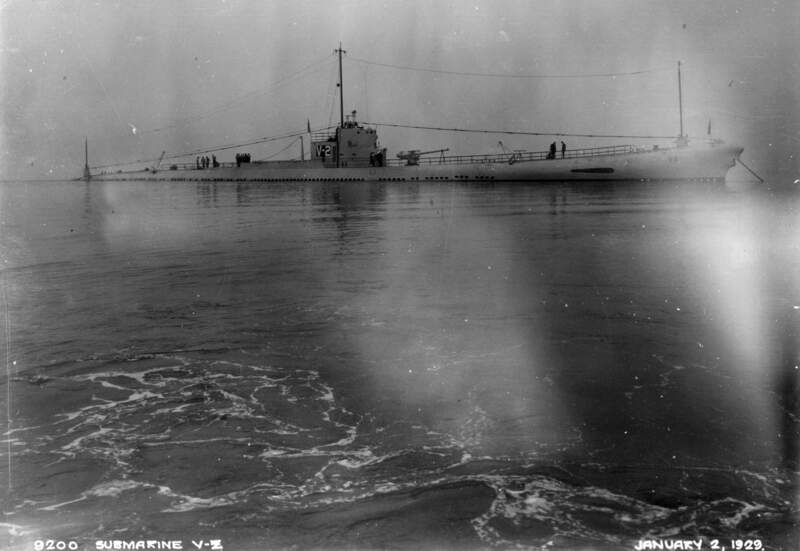 1.30k Starboard side view of the Bass (SS-164), underway, 23 August 1935. Note the unusual raised deck section around and abaft the bridge fairwater. 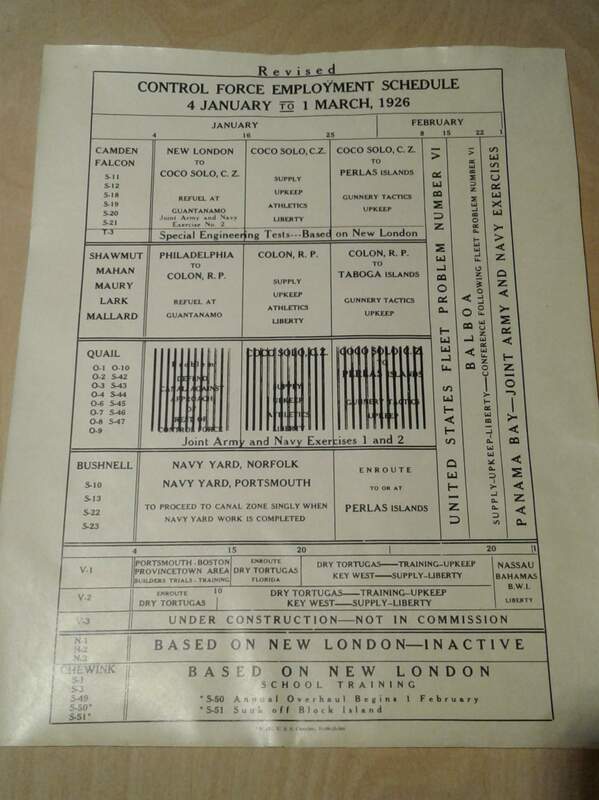 Partial text courtesy of U.S. Submarines Through 1945, An Illustrated Design History by Norman Friedman. Naval Institute Press. USN photo # 80-G-463342 from NARA, College Park, Maryland, courtesy of Sean Hert. 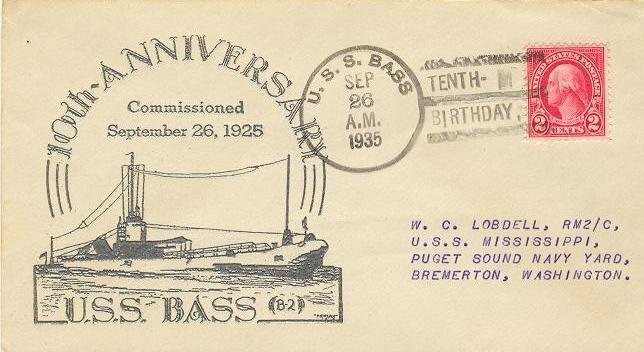 69k Commemorative postal cover marking Bass's (SS-164) 10th anniversary commissioning, 26 September 1935. Courtesy of Jack Treutle (of blessed memory). 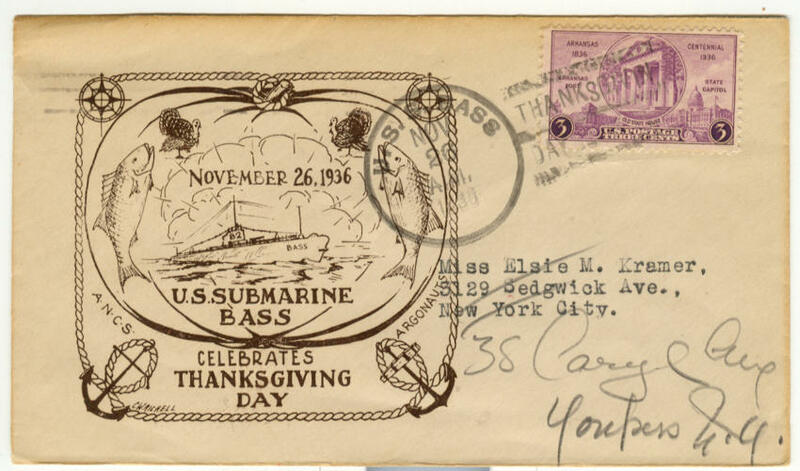 69k Commemorative postal cover marking Thanksgiving Day on the Bass (SS-164), 26 November 1936. Courtesy of Jack Treutle (of blessed memory). 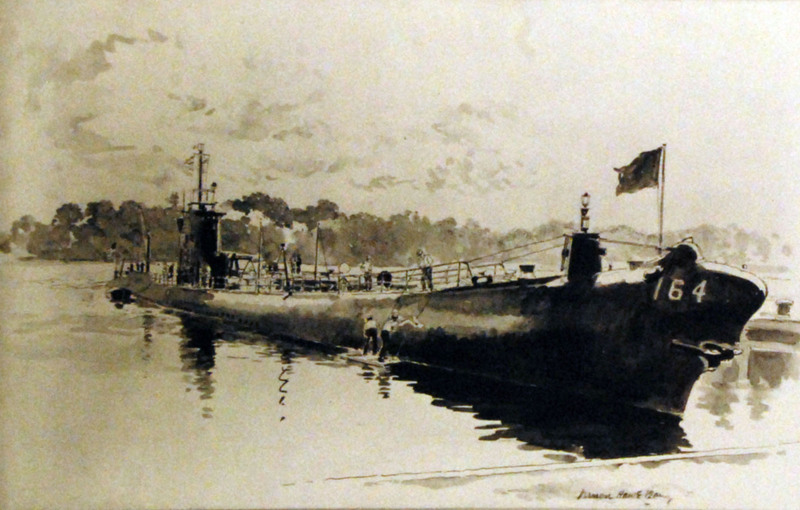 314k Bass (SS-164), Artwork by Vernon Howe Bailey. 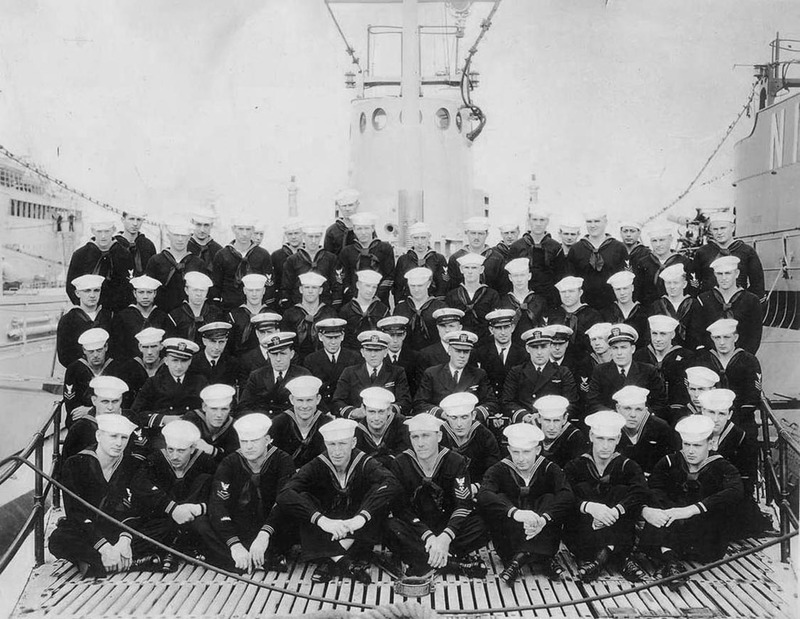 U.S. Navy photograph # 428-GX-USN 1159532, now in the collections of the National Archives, from the National Museum of the U.S. Navy via flicker.com. 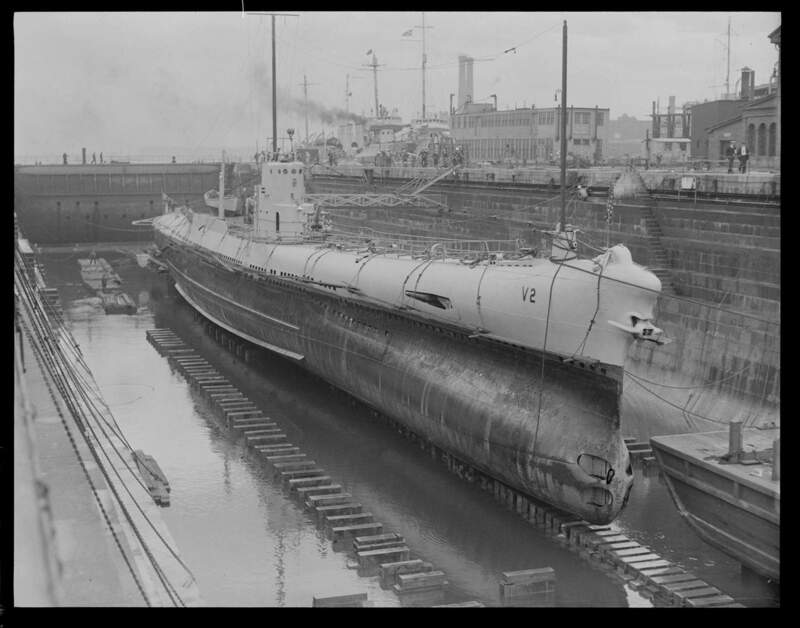 565k 5 photo PDF of showing starboard quarter view of Bass (SS-164) (B-2 still marks her conning tower) in dry dock at the New London submarine base in August 1940 on the occasion of the visit of President Franklin D. Roosevelt to view the defenses in New England. The motorcade is approaching the submarine. 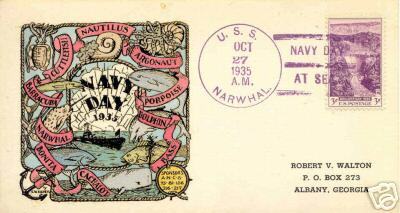 At this time, Roosevelt visited Boston Navy yard and the Submarine base in New London. Source: Life Magazine Archives, Thomas Macvoy photographer, shared by Peter DeForest via Mike Green. 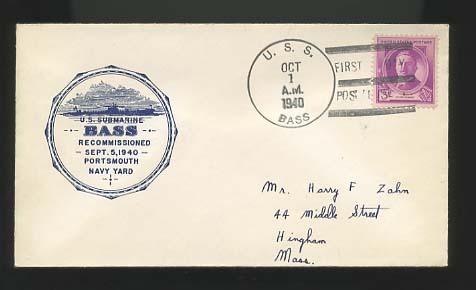 32k Commemorative postal cover marking Bass's (SS-164) recommissioning, 5 September 1940, at Portsmouth, NH. Courtesy of Jack Treutle (of blessed memory). 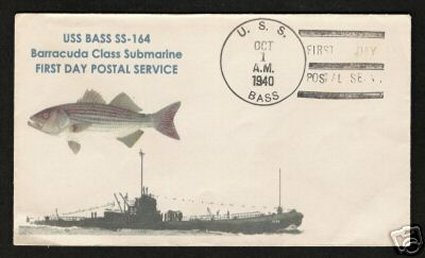 20k Commemorative postal cover & photo inset marking first day postal service on Bass's (SS-164) recommissioning, 1 October 1940, at Portsmouth, NH. Courtesy of Jack Treutle (of blessed memory). 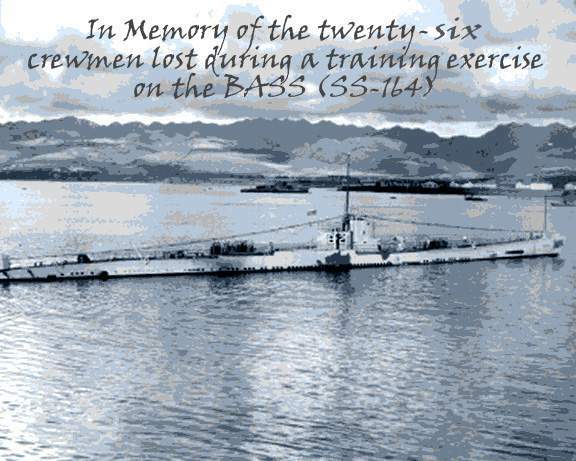 175k On 17 August 1942 while at sea, a fire broke out in the Bass's (SS-164) after battery room and quickly spread to the after torpedo room and starboard main motor, resulting in the death of 26 enlisted men by asphyxiation. This is a commemorative photo honoring their memory. Text courtesy of DANFS. Dante's Prayer courtesy of Loreena McKennitt via quinlanroad.com. 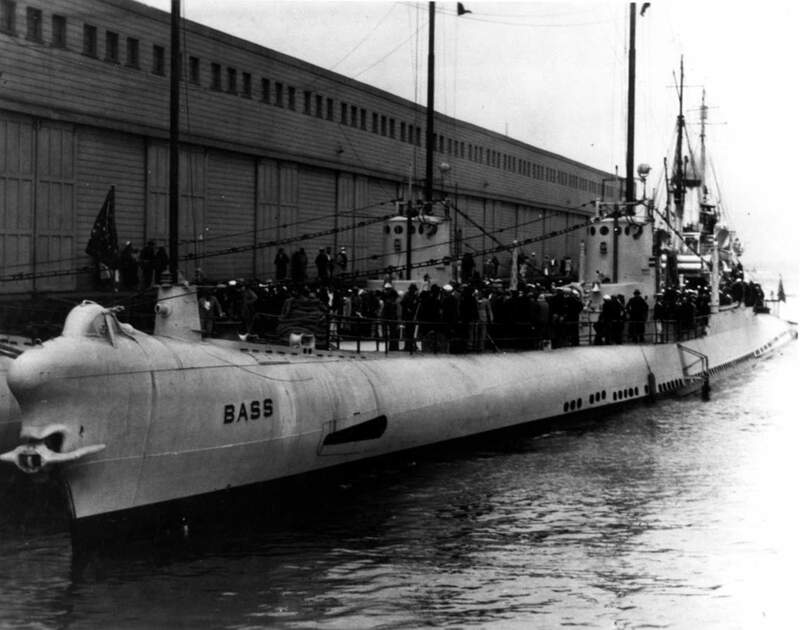 50k Bass (SS-164) is shown here, newly converted to a cargo submarine, off the Philadelphia Navy Yard on 30 March 1943. Conversion was relatively simple because she had a pair of battery-charging engines in addition to the main engines that drove her propellers directly. The battery chargers could drive her electrically (by being connected to her motors), with the main engines disconnected. Thus the main engines could be easily removed to leave space for cargo. Similar flexibility made it relatively easy to remove one or two engines from a much later generation of diesel-electric Gato-class or Balao-class submarines after WW II. 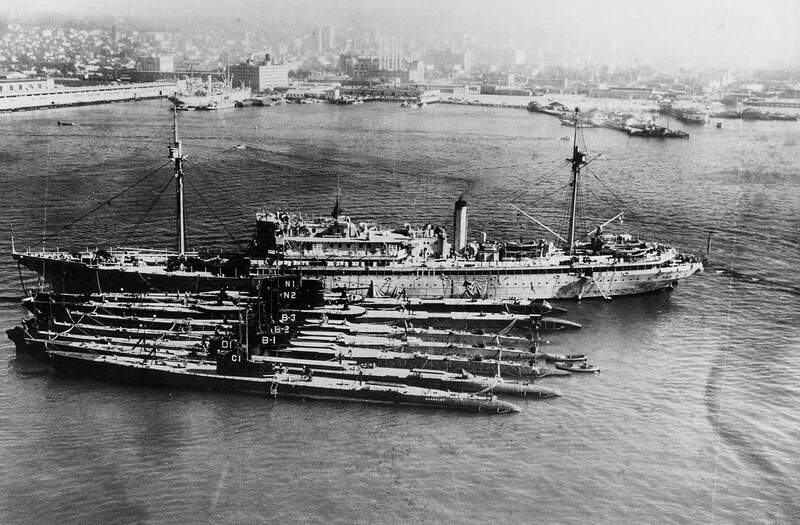 Foreign navies, whose submarines were generally directly driven by their diesels, enjoyed no such flexibility. Photo & text courtesy of U.S. Submarines Through 1945, An Illustrated Design History by Norman Friedman. Naval Institute Press. 1.10k Bass (SS-164) remained in the Canal Zone until October 1942 when she departed for Philadelphia, arriving on the 19th. 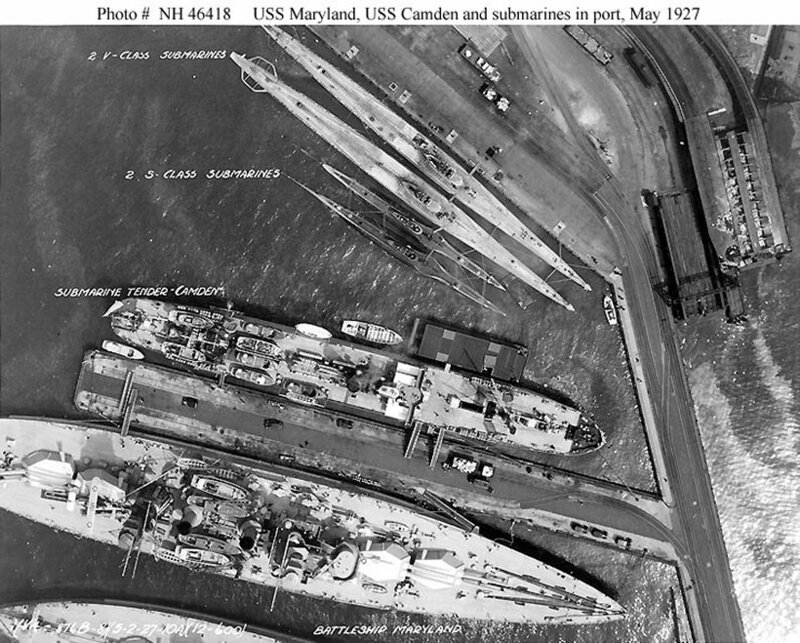 After undergoing repairs at Philadelphia Navy Yard Bass proceeded to New London, Conn., where she conducted secret experiments off Block Island in December 1943. 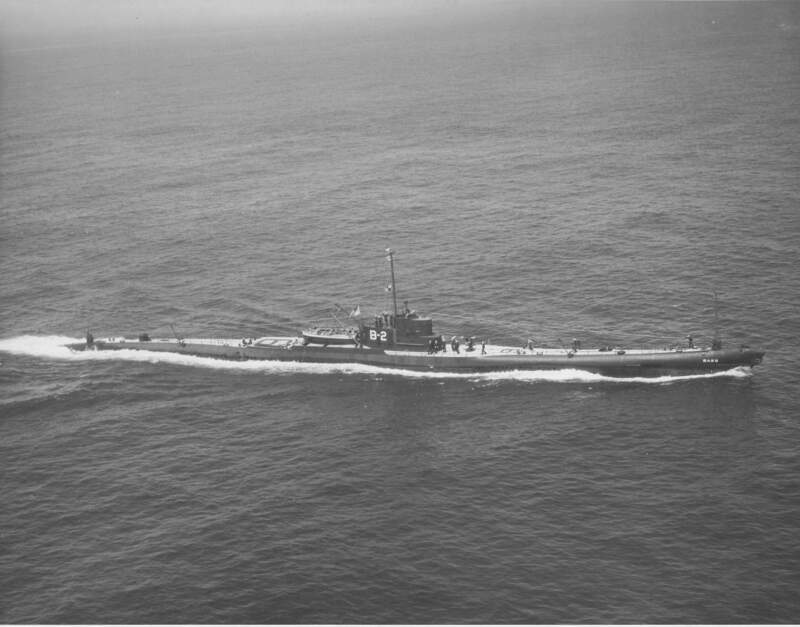 She is seen here underway on 16 November 1943. Text courtesy of DANFS. US National Archives photo # 80G-450242, from NARA, College Park, Maryland, courtesy of Sean Hert. 31k Bass (SS-164) is shown as built (top) and as stripped for sinking (bottom) after having served unsuccessfully as a cargo submarine. The big compartments fore & aft of the control room (below the conning tower) were the forward & after engine rooms, respectively; the former accommodated the battery-charging engine. Compartments abaft the main engine room were, forward to aft:the maneuvering room above the motor room, crew's quarters above the aft battery, crew's mess, the after torpedo room & the steering gear room. Additional crewmen were accommodated in the small upper deck compartment above the forward engine room. Forward of it were officer's quarters above the forward battery & then the forward torpedo room. As in the earlier submarines, the conning tower was a vertical cylinder. Conversion to a cargo carrier entailed removal of the main engines, so that the after engine room could be used for cargo. The forward & after torpedo rooms were used also for cargo storage. Drawing by Jim Christley, text courtesy of U.S. Submarines Through 1945, An Illustrated Design History by Norman Friedman. Naval Institute Press.